This is a composite cross, made from fragments of two different crosses. The base measures 1m high and 1.5m x 1.35m. The shaft measures 2.65 high and 63cm x 44 cm in thickness. 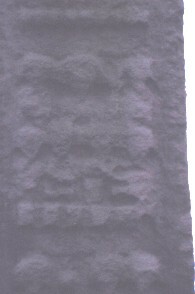 This is a close up of one panel of the north west face of the composite cross at Clones, Co. Monaghan. This panel NW2 depicts a New Testament scene. John 2: the Marriage Feast at Cana. The Marriage Feast at Cana. New Testament. John 2. This panel has two layers of figures the top part has 3 figures while the bottom part has 4 figures. 96th Annual Report of the Commissioners of Public Works in Ireland 1st, , Dublin (1929) . Calvert, J.A., The Early Development of Irish High Crosses and their relationship to Scottish Sculpture in the ninth and tenth centuries , University of California, Berkeley (1978) Ph.D, . Edwards, N., , ‘An Early group of Crosses from the Kingdom of Ossory’. In Journal of the Royal Society of Antiquaries of Ireland (1983) 113, 5-46. Harbison, Peter, , ‘On some possible sources of Irish High Cross Decoration’. In Festschrift zum 50jahrigen bestehen des vorgeschichtlichen seminars Marburg. Marburger Studien zur vor- und frühgeschichtlichen I (1977) 283-297. Frey, O.-H., Festschrift zum 50jahrigen bestehen des vorgeschichtlichen seminars Marburg. Marburger Studien zur vor- und frühgeschichtlichen I 1st, , Gladenbach (1977) . Henry, F., La Sculpture irlandaise pendant les douze premiers siècles de l'ère chrétienne 1st, , Paris (1933) . Henry, F., Irish Art during the Viking Invasions (800-1020 A.D.) 1st, , London (1967) . Kuhn, W., Die Ikonographie der Hochzeit zu Kana von den anfangen bis zum XIV. Jahrhundert 1st, , Freiburg i. Br. (1955) . Wakeman, W.F., , ‘On the Ecclesiastical Antiquities of Cluain-Eois, now Clones, County of Monaghan’. In Journal of the Royal Society of Antiquaries of Ireland (1874/75) 13, 327-340.